This programme includes the famous islands, but also some less well-known sites. This programme departs daily from April to October. After a morning transfer to the port of Piraeus, embark on the ferry to Milos. Be welcomed at the port for a transfer to the selected hotel in Santorini. Enjoy this unique horseshoe-shaped island, set in the blue waters of the Aegean, bathed in radiant sunlight and scattered with small white houses. 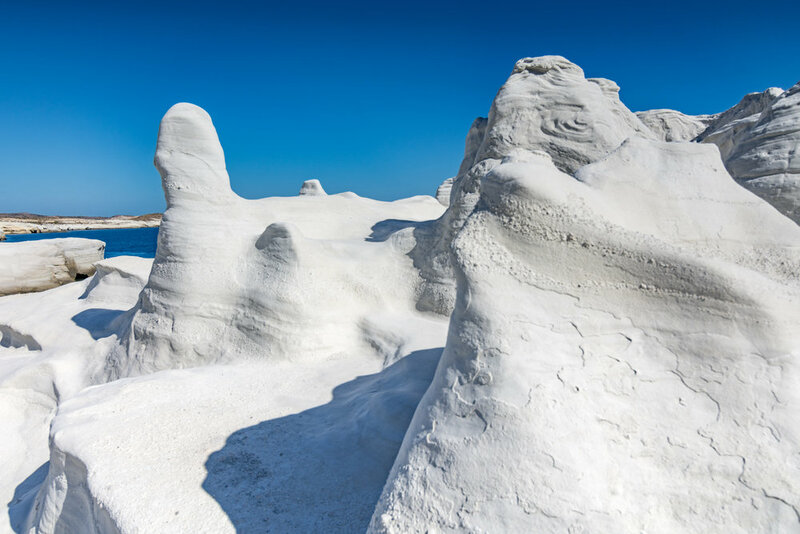 A volcanic island, Milos is known as the island of colours, mainly because of its spectacular, colourful rock formations – with white, red, yellow and black rocks. Milos is also known as “The Island of Lovers”, because the famous statue Venus de Milo, representing the Greek goddess of love and beauty, was found here. After a transfer to the port, embark on the ferry to Santorini. Be welcomed at the port for a transfer to the selected hotel in Santorini. Relax at this most breathtaking island. Enjoy a half-day cruise to the small islands of Nea Kameni and Palea Kameni, located inside the caldera. See the volcanic hot springs with the green and yellow waters. Take advantage of Greek snacks and local wine included in the cruise. At the town of Fira, admire the white-washed houses, narrow streets and open-air cafes that cling to the steep cliff accessible by cable car or mule. After a transfer to the port, embark on the ferry to Mykonos. Be welcomed at the port for a transfer to the selected hotel in Mykonos. After a transfer to the port, embark on the ferry to Piraeus. Be welcomed at the port for a transfer to the selected hotel in Athens.